Away from the noise of CES, away from the curved 4K TVs, activity trackers and sad accessories, I’m sitting in the cockpit of a spaceship. I look to my left, lean in to inspect a screen of information, and do the same on a screen to my right. All systems are go. When I give the thumbs up, I’m launched into the middle of a huge, operatic space battle. I look to my left, and there is a beautiful galaxy swirl off in the distance. To my right, vessels the size of skyscrapers are deploying space fighters. It’s beautiful and mesmerizing, like I’m actually in space, fighting for the Rebel Alliance in Star Wars. I now know what it’s like to be an astronaut. When I turn to face forward, I’m face-to-face with the backside of an asteroid, and I flinch so hard I literally jump out of my seat. 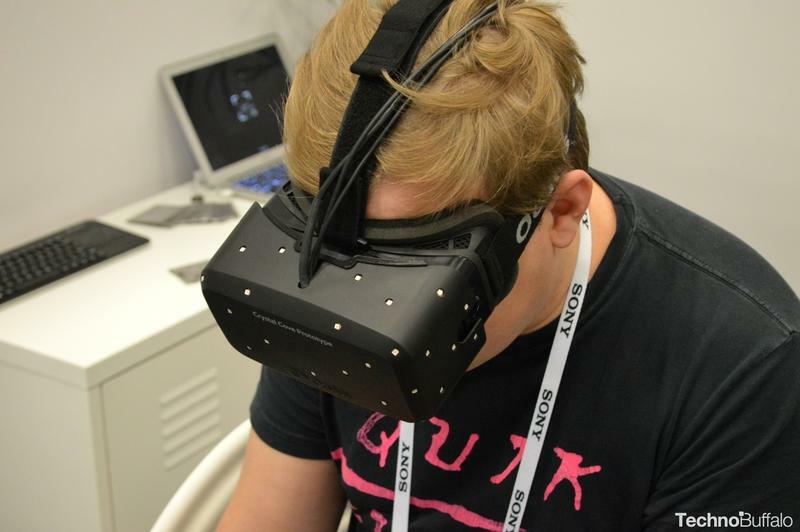 This is what it’s like wearing Oculus’s new Crystal Cover prototype. I’ve seen a lot of cool stuff here on the show floor this year, but nothing quite as amazing as Crystal Cove, Oculus’ more advanced virtual reality headset. The company has been privately showing it off all week here at CES, and TechnoBuffalo got the opportunity to check it out on Wednesday. In short, we couldn’t have come away more impressed. 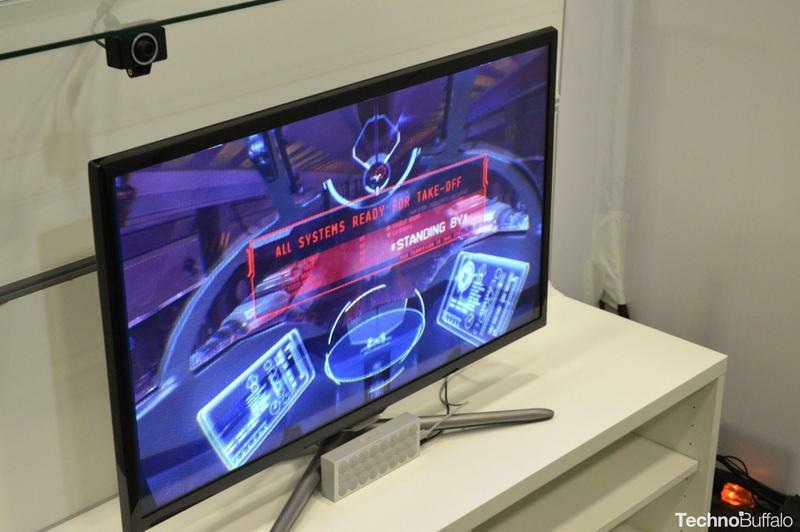 You’ve probably heard of the company’s early Rift prototype, the dev kits and HD model shown off at E3 last year. You’ve probably heard of how immersive the experience is, how this is virtual reality done right and how it could become the future of gaming. During our brief time with the Oculus team, hearing about the technology’s future, how the company plans to take over your living room, and then experiencing it for ourselves, we can say without any hesitation that Oculus more than meets the hype. Expectations for products these days—especially Kickstarter products—are often set so high that they’re disappointing when they finally come out (if at all). But this is one that is warranted, and deserves plenty of respect for how far the company’s technology has come in so little time. If you’ve experienced Oculus’s headset first-hand—this was our first time—there are a few upgrades to Crystal Cove that make it such a joy to use. 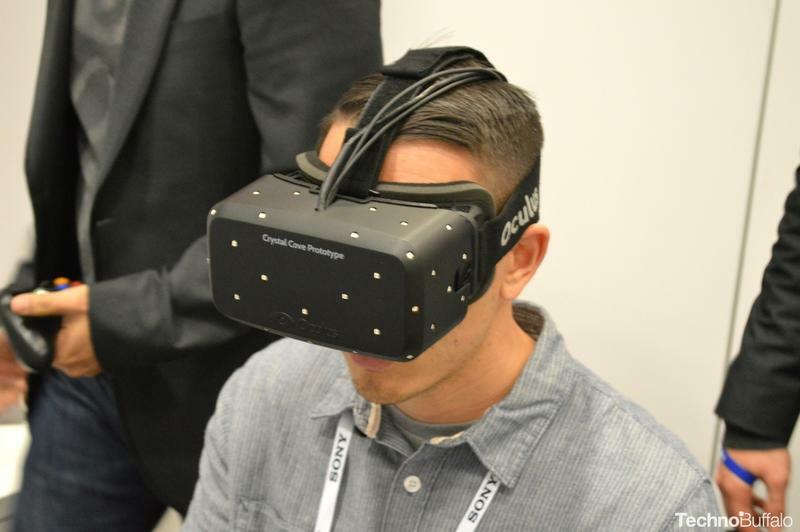 Nate Mitchell, VP of Product for Oculus, said that the first thing the company focused on was “positional tracking.” The dev kit that Oculus released last year was able to track a user’s head—yaw, tilt and roll— very precisely through custom technology built specifically for VR. But the company realized early on that when a user moved his or her head, their body often moved, too. Oculus wasn’t able to track that movement, so when you tried to lean into something, like a water bottle for example, it moved away from you as you tried to get closer. Your brain would then process this as something that wasn’t quite right, taking people out of the VR experience. Oculus found a solution with Crystal Cove by putting IR LEDs right onto the Oculus goggles, and then pairing that with a camera. That gives Oculus the ability to actually track where the LEDs are through custom vision technology, giving users the ability to do things like look around corners and lean in super close to objects—exactly like you’d do in real life. It worked really well in both demonstrations we were shown—one of which I mentioned above. The other thing that Oculus focused on was achieving “low persistence,” which essentially eliminates what we’d associate with motion blur. On earlier versions of Oculus goggles, the company had to make due with LCD displays at just 720p resolution. Crystal Cove is equipped with OLED screens in Full HD, which makes the low persistence possible because of its sub-millisecond pixel switching time capabilities. The less time Oculus can display the right image in your goggles, the closer the company can make its virtual reality experience seem like real life, Mitchell explained. “What low persistence does, is that we actually turn the pixels on, and say here’s that image, the correct one, and then immediately turn them off,” Mitchell said. 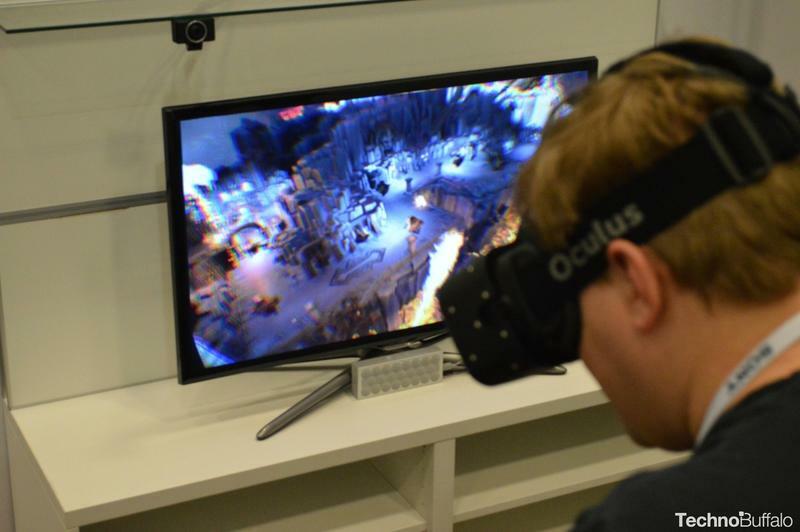 Oculus will only show users the right image, which makes for a more immersive and stable experience. “We eliminate all that bad data, and all that bad light, which was really just confusing for the brain,” Mitchell said. “That means at the end of the day, the experience looks more realistic than ever with low persistence. There’s a lot more visual stability. It makes such a substantial difference.” Before, without low persistence, you couldn’t read something like text if you shook your head left and right, Mitchell added, because it would appear as if there was terrible motion blur. Mitchell and Joe Chen, Product Lead at Oculus, were able to show us what a game looked like with low persistence turned off, and the difference is night and day. It really is difficult to explain just how incredible the experience is. 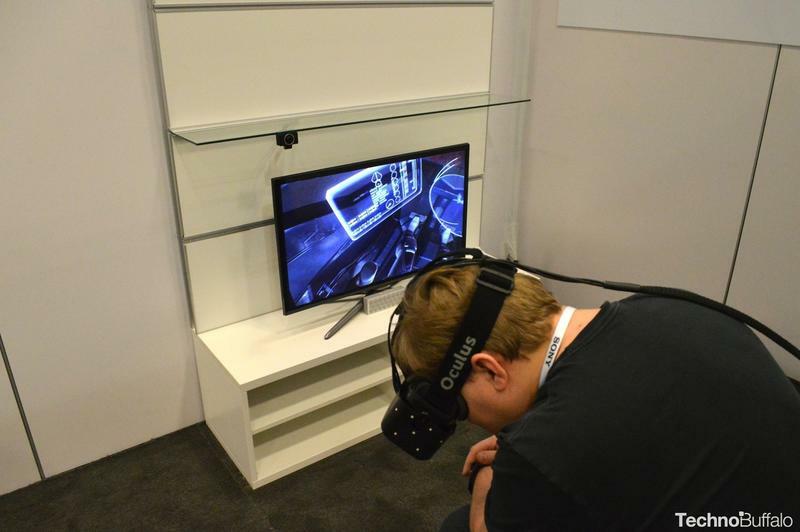 Before trying Oculus out, I was skeptical, and figured it would be neat but not really mind blowing. I couldn’t have been more wrong. The space fighter game Oculus showed us particularly blew me away—I never wanted to stop playing. I would trade all the next generation games in the world for that amazing and incredible space fighter sim. All of them. Never has a game felt so real, and it was merely built to demonstrate Oculus’s new Crystal Cove technology. Games that companies work on for years aren’t as fun or immersive. Crystal Cove isn’t even a consumer model—a release date hasn’t yet been set, but Oculus told us the company has a specific timeframe in mind. Even so early on, it performs incredibly well. Since this is a prototype, however, there are still some issues, such as that am-I-looking-though-a-screen? effect, but it’s by no means bad enough to take away from the experience. In fact, I only noticed it when I first put the headset on, and immediately forgot about it as I was shooting other space ships down. It was amazing because you would control your space ship, go left, go right, up and down, but you could also just move your head to look around and pick out targets off in the distance. It was exactly like real life (minus the space ships). 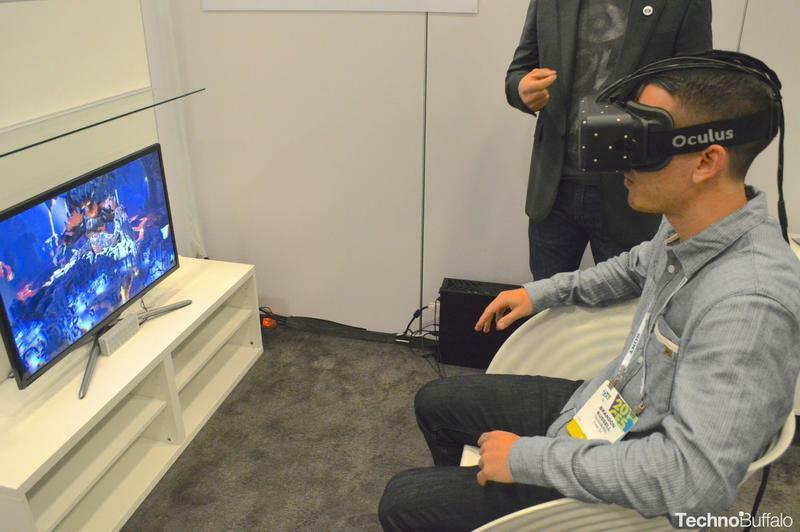 Oculus’s technology is what gets us excited about the future, and what the Consumer Electronics Show is all about. When people say that Oculus can change our opinion on VR and alter the gaming landscape, it isn’t just some PR bluster. Oculus is, without a shadow of a doubt, the real deal. If the company can make a consumer model that’s as convincing as the one we were shown, it’ll be a huge hit. I already love what was shown off—I just wish I could take one home now.